Mars and its "rival," the red star Antares, will dance together in the night sky on Sept. 28, 2014. If your skies are clear on Sunday evening (Sept. 28), take a look low toward the southwestern sky as darkness falls. For a couple of hours after nightfall, the planet Mars will be a fairly conspicuous light. The Red Planet (which is actually orange-gold) will have a companion this evening. Sitting below and to its left will shine the reddish 1st-magnitude star Antares, whose name derives from the Greek for "rival of Mars." 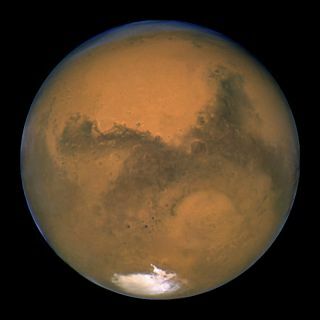 On this occasion, Mars will be considerably brighter than its so-called rival — 0.3 magnitude, or 32 percent, more luminous. So just how did Antares get its name? This sky map shows the location of Mars and the bright star Antares, as well as the moon, Saturn and dwarf planet Ceres, in the southwestern sky at 8 p.m local time for observers in mid-northern latitudes. The five naked-eye planets that were known to the ancients were named for ancient deities. One planet appeared to rapidly shift from one side of the sun to the other, so it was named for Mercury, the swift-footed messenger of the gods. Mercury was also given separate names for its appearance as both a morning star (Apollo) and as an evening star (Hermes). Greek astronomers knew, however, that the two names referred to the same body. The most brilliant planet, often seen against a cobalt-blue twilight sky at dusk or dawn, was named for the goddess of beauty, Venus. Another planet, usually second only to Venus in brilliance, was named for Jupiter, the king of the gods. Some might wonder why that title was not accorded to Venus, but that dazzling planet’s visibility is typically limited to within a few hours of sunset or sunrise. Further, Venus rarely gets much higher than about halfway up from the horizon to the overhead point, whereas Jupiter’s possible timeframe of visibility can encompass the entire night. In addition, there are certain times when "the king" can appear to soar much higher in the sky than Venus. The fact that Jupiter is also the largest planet in the solar system — something unbeknownst to ancient stargazers — can only be attributed to a fortuitous coincidence. Of the original five, one planet seemed to move most slowly against the background stars, and so it was named for Saturn, the elderly god of time and agriculture. The most colorful planet appeared to shine with a yellowish-orange hue, seemingly suggesting the color of blood and was thus named for the god of war. The Romans called that god Mars, while the Greeks knew him as Ares. But among the so-called "fixed" stars, there was one that shone rather brightly while also displaying a distinct reddish hue. In fact, that star looked more blood-red than did Mars itself. So the ancient Greeks assigned the moniker Antares, or "anti-Ares," to this star, probably in reference to its color and not to its brightness. The story gives us all something to think about during these final days of September, when Mars and its "rival" pair off low in our southwest evening sky.